Sohayla Smith - "Talk of the Town!" With over 22 years of experience in music and multimedia, as well as performance skills in singing, songwriting, and more recently, acting, Sohayla Smith's transition into voice-over work is a natural one to say the least. 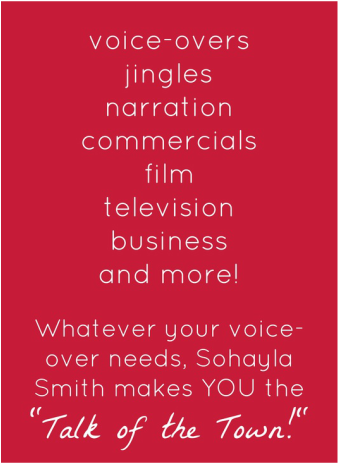 Whatever your voice-over needs, Sohayla Smith makes YOU the "Talk of the Town!". Sohayla offers the perfect voice to represent your company, product, or service, in radio, television, commercials, and business or film narration. Sohayla's voice is described as: "Warm but professional, articulate, and sincere" by Joshua Oatman, Filmmaker. "Sultry, smooth, and naturally commands attention" by Adrian Smith, Audio engineer/Music Producer for Troupe-Adore. "Deep, feminine, and sometimes husky, with a hint of gypsy-like mystery" by Kelly McDowell, Entertainer. "Confident and analytic" by Gord Craig, local community activist. "Calming" by Sherri Giles, SSW. Child voice overs provided by Roxton Smith. His voice is described as warm, young, and adorable! 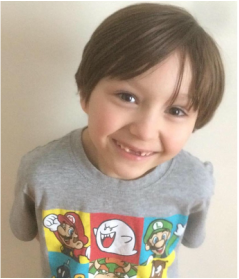 He's only 6, but a dedicated little voice actor! His first professional voice work was for Coldwell Banker Marsh Realty.